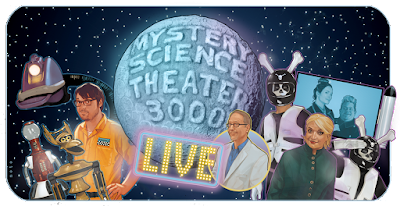 We get two different movies to be made fun of by the current Mystery Science Theater 3000 crew in LA this July. It's part of the US Tour, the "Watch Out for Snakes!" Tour. Whose showing up? "Appearing with Joel and Jonah live on stage will be robot companions Crow, Tom Servo and Gypsy, along with Synthia (Rebecca Hanson) and her Bonehead henchmen. Of course, it wouldn’t be MST3K without the ever-present surveillance of the Mads, Kinga Forrester (Felicia Day) and TV’s Son of TV’s Frank (Patton Oswalt) checking up on their unwilling test subjects via remote video." For the films "Show # 1 is the MST3K favorite “Eegah” featuring all new riffs and sketches. Show # 2 is a “Secret Surprise Film!” It’s a fun, sci-fi thriller never-before featured on MST3K and will appear only in select cities." Tickets go on sale tomorrow, May 19, 2017 at noon.